The Moon remains Void-of-Course in Leo for what is essentially the entire day. At 11:57 PM EDT it moves into Virgo. Thus we’re presented with another “Twilight Zone” day that allows us to absorb and integrate what was unleashed during yesterday’s New Moon in Leo. Early in the day we may be confronted with a variety of emotional roadblocks and uncomfortable situations that are guaranteed to make us uneasy. The Moon clashes with Pluto at 12:09 PM EDT; La Luna’s next aspect is with Uranus at 5:48 PM EDT, so some sort of emotional “depth charge” or clearing may trigger an unusual or unexpected response. Example: Someone has been harboring resentment towards another person they’re close to. The storm’s been building and building, and today some totally insignificant action leads to a totally unexpected downpour. (See the Sabian Symbols, below, for an echo of this situation.) Usually this happens when something changes or shifts in the relationship. Or because we’re becoming painfully aware of the areas in our lives that aren’t working. I was watching someone power wash a house recently. It blasts all the crud off –nothing can resist the pounding water slamming into the bones of the house. Which leads me to today’s major aspect, Jupiter in Cancer opposite Pluto in Capricorn. This one’s like Big Brother meets Even Bigger Brother. Since this is the first “hit”, it doesn’t mean we’ll just feel it today and then it goes away. These two planets will interact three times before they’re through. And don’t forget Uranus in Aries hovering around to get the whole crazy train rocking off the rails. When you’re dealing with an opposition aspect, generally things swing to an extreme one way, then the other, and eventually learn to meet in the middle (if you work at it). Jupiter, king of what’s above ground, and Pluto, Lord of the underworld, are duking it out now. Huge changes in home and family (the Cancer end) and business, bureaucracy and structural change (the Capricorn end) cause seismic shifts that create huge reverberations. It can all get a little unhinged. Political and religious extremists and “end of the world” fetishists crawl out of the woodwork. Jupiter in Cancer can go all “Father Knows Best”; then Pluto in Capricorn shows up and tears that playhouse down. It’s really a battle of the titans, symbolic of the “sea change” that’s occurring right now in all of our psyches. There’s little wiggle room for sentimentality or wastefulness. We need to learn to work with what we’ve got. Once we learn that lesson, massive growth is possible. Jupiter helps us see what’s possible, while Pluto can move heaven and earth to make those changes happen. This could be a pivotal point when we finally decide that something’s not working and is never going to work in its present form, so we make a real push to change the situation. Maybe the path we’ve been on isn’t the right one for us after all, and reorientation is necessary. Pitfalls: paranoia, fundamentalism and “true believerism”, brainwashed sleepwalking disorder, “might makes right” jingoism, excessive spending, borrowing or wasting resources, and even hubris combined with sexual excess (see New York politicians Weiner, Spitzer, et al) . At 9:40 PM EDT the Moon makes an easy aspect to Mercury, so it’s a good time to have a chat with with someone simpatico. Once the Moon enters Virgo at 11:57 PM EDT, if you’re still awake, you may feel like taking a small practical step to fix one of the situations you’ve been worrying about for the past few days. Or else you’ll just wake up in the middle of the night obsessively thinking about your problems! Try and use that Virgo energy to purify and perfect rather than flying over to the OCD-nitpicker dark side of Virgo. 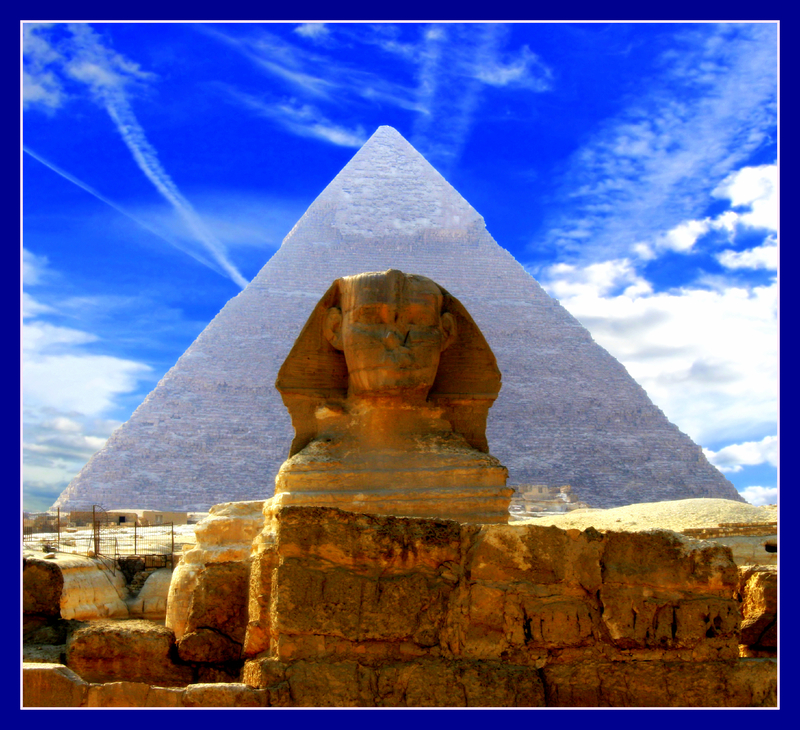 Today’s Kozminsky Symbol, featuring a pyramid in sand, brings to mind the monuments of Egypt. On a mundane level, this illustrates the “gathering storm” occurring in Egypt as political unrest continues and a variety of factions protest or struggle to win a place in the future governing body of the nation. The essence of this Symbol is timelessness and the ability to stay strong in the midst of any and all difficulties. It’s about maintaining dignity in the midst of strife, attempting to preserve what’s valuable. Kozminsky says: “He will see many pass through this world of matter before he receives the call, and will keenly feel and deplore his errors.” There’s a sense of eternity, of karmic blowback. This is similar to the concept of souls being weighed after death that’s a feature of the ancient Egyptian belief system. It connects with today’s Jupiter/Pluto opposition as it shows the evolution of philosophy and belief systems (Jupiter) when confronted with the inexorability of the natural processes of life/the harvest and recycle scenario (Pluto). The Sabian Symbol also features storm clouds, but these clouds are moving on and the sun is breaking through. The theme of this Symbol is recovery (as in healing or recuperation) and re-entry into the flow of life after a difficult period. “Sunshine after the storm” gives relief and hope–the storm has purged all negative ions and has cleared the air. This Symbol is similar to the Sabian Symbol, as one of its meanings is the ability to stand your ground and maintain equilibrium even during difficult times. Remember your ultimate goal, your purpose in life, and stand strong. Use challenging situations as fuel for learning and growth. This Symbol is also connected to rebirth and the ability to enjoy good times after a tragedy/difficult situation has passed. Observation of and connecting with nature may help you understand we all live in cycles. Again, there’s a connection with the Jupiter/Pluto opposition –these two outer planets, when they connect, relate to larger transformative forces occurring during a particular time in history. On the down side, beware of being overemotional or overreacting to stress. Try not to become too discouraged by setbacks, and don’t drag other people down because you’re going through a hard time. “Pushing the Reset Button”. It’s time to accept that fact that a change is necessary. Temporary difficulties that cause permanent shifts in direction. Being told the truth about yourself. Hearing the call, heeding the inner voice. Even if you don’t like what you hear, you needed to hear it in order to reorganize your life. Learning from a wise teacher. Using limitations as a springboard for growth. “I needed to hear that.” Your inner voice is shrieking big time–pay attention and make changes accordingly. Becoming an apprentice even though you have a great deal of experience in another field. Channeling or “hearing voices”. A shift or change in the way you support yourself or make money. Arguments or hard words related to your plans to start over. An avocation related to speaking, using words, talking or communication that winds up becoming your true vocation. Moving from thought to manifestation because you’re willing to do the work for the pure creative joy of it.